Our Christmas shopping is done (although Lisa wanted to get me something). The weather today was forecast to be (relatively) warm. 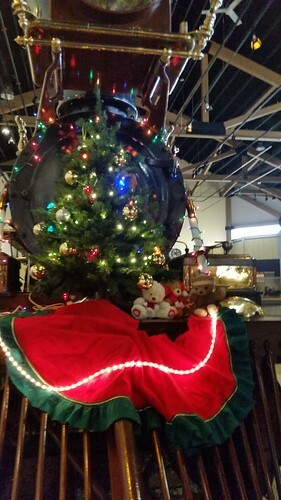 So after breakfast, we headed over to Carson City to the Nevada State Railroad Museum. We were greeted by this herd of wooden reindeer on the lawn outside the museum. Later that day, we by coincidence stumbled across the local artist making them at a mall in Carson City. 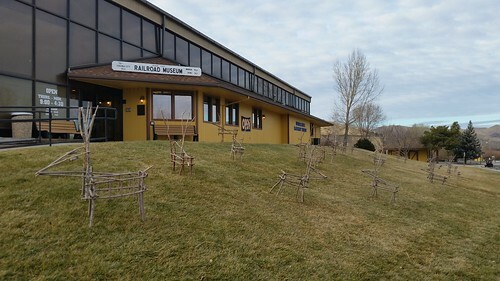 The NSRM is not running trains on this final weekend before Christmas, and in fact the museum annex was closed because the volunteer staffing it got too cold. But we spent quite a while talking with some of the volunteers and making a tour around the permanent exhibits. Most of the exhibits were decked out with Christmas lights. Kuma Bear saw these bears riding on the pilot of one of the locomotives and joined them for a photo. 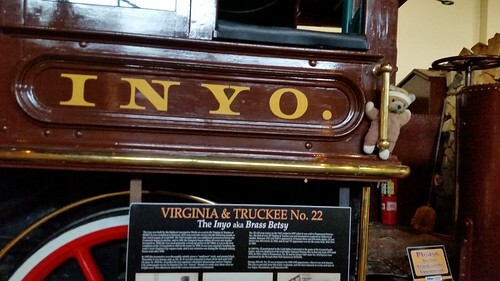 I pointed out the sign on the footplate and Kuma said, "Thats fors peoples. Bears goes wheres Bears wants." Lisa shopped the museum gift shop for my Christmas present. (As museum members, we get a 10% discount on most items except used books. OTOH, used books tend to be our most common purchase!) We then returned home, making a couple of desultory shopping stops along the way but not buying anything. We're not taking a Christmas trip, partially because I have to work on Tuesday, but as I get a four-day New Year's holiday, we keep thinking of doing a short trip away from home. We have made no decisions, though.